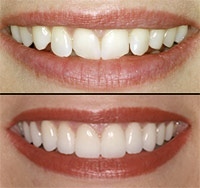 Veneers can be an excellent way to redesign and reshape your entire smile. Veneers are very thin ceramic shells that covers your existing tooth structure. By placing these new veneers on your teeth, we are able to fix the look of issues such as staining, cracked teeth, spaces, misaligned teeth, chipped teeth and many other issues. Creating your new smile with porcelain veneers usually takes two to three visits. At the first visit, we will discuss the shape, color, position and look of your teeth and what we are going to accomplish by placing the veneers. Then we will carefully prepare the teeth for the placement of the new veneers. Next, we will take an impression of the newly prepared teeth. This impression will be sent to our laboratory for the final product to be fabricated. This process at the laboratory takes approximately three weeks. While the new veneers are being fabricated at the lab, you will have beautiful temporary veneers. As your new veneers are placed onto your teeth, we will make every effort to make sure that they will feel just like your natural teeth. We will bond them into place ensuring that you can enjoy your new smile for a very long time!